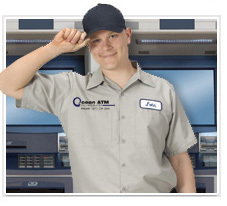 Ocean ATM offers a comprehensive maintenance program to its customers for a nominal fee. With the high cost of ATM parts and labor to repair the ATMs, many of our current customers opt for our no hassle maintenance program to give them peace of mind. If something goes wrong, we will repair it. Our ATM maintenance program is charged on a per transaction basis making it painless to the ATM Owner. Another important factor to consider is that if your ATM is not covered under the manugacturer’s warranty or an extended warranty, it may be down for a few days. Depending on part availability, that will most likely end up costing you more than the warranty would have. Don’t get stuck with a high repair bill on your ATM. Please contact us through the form below for more information on our comprehensive ATM warranty program today.